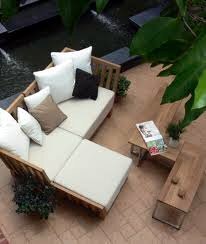 Teak Garden Furniture is one of the most important features of every garden. It provides you a comfortable place to rest and gives your garden an additional function. In addition, a well selected garden furniture which blends with your garden will help you make it even more beautiful. The offer of garden furniture was never larger and finding a set that matches your taste for beauty as well as your garden’s style is therefore childishly easy. You can choose between the traditional and contemporary garden furniture as well as a number of distinct styles, while most garden centres also offer exotic styles enabling you to create just about any kind of ambiance you want. However, choosing a garden furniture solely on the basis of its aesthetic appeal will not necessarily enable you to truly enjoy it. The importance of material from which the garden furniture is made cannot be emphasized enough. Your garden furniture will be exposed to the harsh outdoor conditions and should be able to withstand rapid temperature changes, moisture, heat, rain, direct sunlight, insects and other garden visitors, etc. 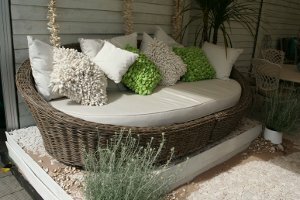 There are not many materials which could fight all the mentioned factors and for that reason it is crucial to pay attention to the material when buying a new garden furniture, especially if you are not prepared to bring it indoors every time it rains, painting it every year and store it during each winter. And yes, garden furniture which does not have to be protected from the mentioned outdoor elements does exists if you are perhaps wondering. Stone, teak and stainless steel are only a few of several materials which do not need any kind of protection from the outdoor elements, patio garden furniture is without a doubt one of the best choices you can make. Ease of maintenance is another thing that is worth to keep in mind when you are buying new garden furniture. How much care it will require primarily depends on the material from which it is made although the design can also influence the amount of care required. Generally, materials which are naturally resistant to outdoor conditions and simple designs are the most convenient because materials which do not need protection from the outdoor elements require only occasional cleaning, while simple designs do not allow the dirt and dust to accumulate in hard-to-reach areas. Since garden furniture is not inexpensive, especially if you are after quality it is a good idea to pay attention to its durability. And once again the materials play the key role and once again the materials mentioned above are superior over the others. However, some materials which are not naturally resistant to outdoor conditions are extremely durable as well if taken care of properly. One of the best examples is metal garden furniture which can be kept as beautiful as new for decades if protected against rust. In the end, there is the price which unfortunately, is not unimportant. Quality and aesthetically appealing garden furniture is never inexpensive, however, it is usually cheaper in the long run due to its durability. If you can, choose top quality garden furniture because you will not only save money in the long term but you will also give your garden a touch of luxury and prestige.